Total, the fifth largest oil and gas company in the world, kicked off a global campaign aimed at increasing brand awareness and sharing its values with stakeholders, consumers, and media. Total, the fifth largest oil and gas company in the world, kicked off a global campaign in October aimed at increasing brand awareness and sharing its values with stakeholders, consumers, and media. Committed to Better Energy, which first launched internally in January, is focused on expressing the company’s "dedication to move beyond the idea of more in terms of energy into better," explains Melyssa Rodgers, comms adviser at Total. "More is rightly expected of energy companies, but we want to do it better. That means shifting the focus and taking into account expectations of our stakeholders. We have a goal of continuous improvement." 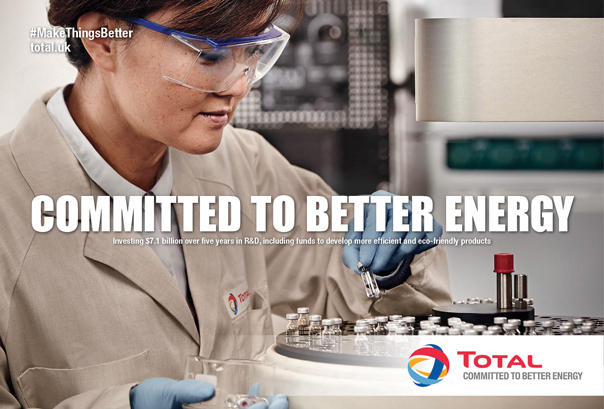 The integrated initiative asserts Total’s focus on addressing climate change by developing a diversified energy mix that has a small carbon footprint and uses resources more wisely. The campaign launched in 21 countries and Total will continue to release TV and print ads, as well as content on social media, in the next three years. Ads are slated to run on 80 TV channels and in more than 230 publications worldwide. Total has displays in 15 international airports, such as Abu Dhabi, Beijing, and Frankfurt, and, for the first time, the brand will advertise in the US with a display at Texas’ Houston George Bush Intercontinental Airport in February 2015. Total created a global Facebook page for the effort. Previously the company had pages for each country that had a different look and feel, says Rodgers. The US landing page went live in mid-September. The brand plans on engaging fans by asking trivia questions, posting content, and more. Rodgers added that Total is also using #MakeThingsBetter to "document our initiatives and talk about them with people interested in the energy sector." Total will also debut a recruitment spin-off in print and digital media that will target occupational groups that are critical of the company, such as drilling specialists and technologists.